Legendary General K.S. 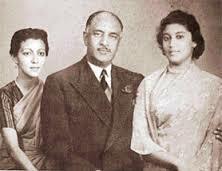 Thimayya’s daughter Mireille Chengappa goes down the memory lane to recall her fond remembrances of her father who won many a battle for India. Today is the 111th birth anniversary of the General who was known as the “soldier’s general”. General Kodandera Subayya Thimayya, popularly known as ‘Timmy’, is a name that inspires not just every Kodava (Coorg) heart but that of all patriotic Indians. The legendary general’s brilliant strategies and daring have set the standard for professional soldiering and leadership. What better way to know Timmy than through his beloved daughter Mireille (in picture with her parents). Mireille and her husband Kongetira M. Chengappa, a retired Major General were gracious and hospitable in sharing some of their views to this reporter in March ,2006, the year that marked the 100th birth anniversary of the General. The name Mireille sounded unfamiliar. The General’s daughter sensing my curiosity went on to give the background. “My mother Codanda Nina was sent to France for schooling as a 13–year-old. She stayed there for 5 years and found this name Mireille very popular in France and resolved to name her daughter as such if she had one’’. Mireille recollected her days in Bangalore: “I was born in 1936 and was admitted to Bishop Cotton Girls school for a brief period, before I went to Woodstock at Mussourie and later had a stint at JJ School of Arts, Mumbai”. She recollected her grandmother sometimes talking of her dad’s childhood. My grandmother would always speak of her son as a mischievous kid who had the passion to join the army and loved outdoor sport like athletics, horse riding and hockey. Mireille could never recollect her father being rude to her. “My parents were very close to me. My mother sometimes nagged a bit but daddy never did. He remained cool and I could discuss everything under the sun with him. He however would advise me to read a lot. He used to always ensure that we travel together but I was only allowed to attend select parties. He enjoyed life to the fullest”. “He loved dancing and partying with good company. His favorite drink was Scotch. He used to laugh a lot and often have people judge him wrongly”. Both dad and mom loved dancing and soon after their engagement, they headed for the dance floor and when there were prizes for the best dancers, they won hands down. They were presented with a synthetic Rose and my mother who died in 1982 kept the rose with her till the end as a prized possession. I also remember my father telling me that he wished to die young. “If god wants to do me a favour – he should take me with my boots on since I hate to linger” and he achieved the same when he died at the age of 59 while in harness. I never once saw my dad stressed out. He seemed the proverbial ‘Cool as a Cucumber’. “He never worried and would always say – let things happen as they should. He was a cut above others in dealing with stress. If worried on the odd occasions, he would turn normal in a short while. He was gifted with a great sense of humour and used this to lighten numerous unpleasant situations. He was very strong in his thinking’’. Mireille does not recollect her dad having any particular liking for food or clothes and felt her dad was quite adaptable. “He had no qualms about food and was never fussy about clothes either. He used to dress very informally at home and was very humble with no airs whatsoever. When he became the General nothing changed – he was the same – the work hard, party hard type. In friendship he remained true. His friends were interesting people and shared the same earthiness”. Mireille remembers her dad as a family man who welcomed relatives from Coorg. He was concerned about his father after his mother’s death. His father lived alone in Coorg and the general visited Coorg every year to visit his father and other close relatives. “In spite of traveling abroad widely – he was never excited since he was totally Indian in thinking. He loved India and would always tell me: “India is a wonderful country and there is so much going for it’”. As a father he was kind and considerate. He would always tell me “Your principles must always be right. Don’t be scared.” At times I would turn up late and even if it was 2 AM – he would wait for me and pretend to work on his files and never used to question me. The next day however he would want to know what happened? The General’s wife was an introvert who missed her gregarious husband much after his death in Cyprus. The General’s grandson K C Belliappa lives in Bangalore and is married to a professional photographer Nicole.The General’s granddaughter Amrita Chengappa (in picture) is married to a German and they live near Almora in Uttaranchal. IS ADVENTURE IN THE BLOOD OF THE PEOPLE OF KODAGU? The late Air Marshal Suren Goyal at whose residence I stayed in New Delhi had a couple of anecdotes about General Thimayya and Field Marshal Cariappa. He used to say that V K Krishna Menon treated Gen. Thimayya in most unethical manner. But the General cared two hoots and went ahead with his assigned responsibilities as the COAS. And rightly, the author has attributed him as the Soldier’s General. You are right Suresh. I do remember reading from the writer Kushwant Singh’s narration of some humorous anecdotes of the habit of the then defence minister Krishna Menon. Menon was a master in the art of one-upmanship, with many tricks up his sleeve. To get one up on General Thimayya and the military top brass, Menon employed a unique trick. On ceremonial occasions, he would often go and sit in the front seat of the car next to the driver, putting the accompanying army chief in a dilemma. How could he sit at the back while his boss, the defence minister/chief guest, was sitting in the humble front seat? General Thimayya found a diplomatic answer to this. He would ask the driver to sit behind and take the wheel of the car himself, and engage the defence minister in casual chat. Engrossed in his self-importance, Krishna Menon never grasped the essence of this tactic. Perhaps he felt elated that he was making the general drive him around, as he made a habit of it and extended this practice to all times,everywhere. Maj Gen (then Capt) Chengappa was instructor at IMA in 1961-62.I was fortunate to be his student. Just like Gen Thimmayya, he too was professional to the core. I remember Mireille in Bishop Cottons, Bangalore! She was my classmate! She had short curly hair, v pleasant w a smile! Doubt if she remembers me!